Black, silver or blue, our brushed metal Personalised Bic Select Slim Metal Pens are the height of premium promotional ball point pens with a customisable print of your Company brand name of either centre barrel of the clip itself. Simply hand these Personalised Bic Select Slim Metal Pens out to customers as a business gift to ensure your name gets out and about. For a FREE QUOTE, please fill in the form regarding our Personalised Bic Select Slim Metal Pens and we'll be able to help you. 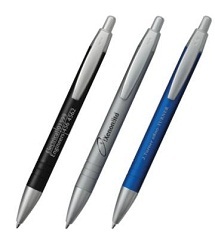 Why not have a look a our Printed Pens department for more excellent promotional pens.